Forget the black tie and heels! 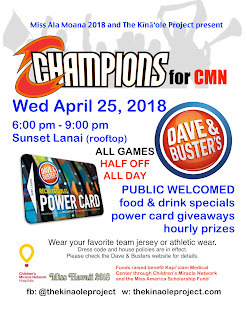 Rep your favorite team or athletic wear at Champions for CMN, a special celebration on Wednesday April 25, 2018 at the Sunset Bar (rooftop) of Dave & Busters. 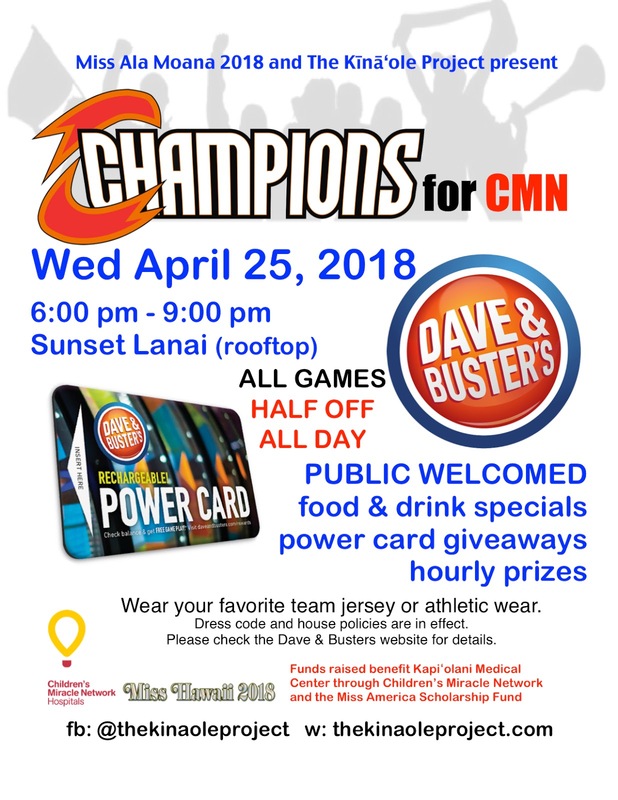 Hosted by Miss Ala Moana 2018, Sarah Champayn Look and The Kīnāʻole Project, Champions for CMN is a winning opportunity to support Kapiʻolani Medical Center through the Children's Miracle Network and the Miss America Scholarship Fund. There is no admission, but donations are welcomed with 100% of proceeds benefiting these distinguished organizations. Bring your friends, family or co-workers up to the rooftop to take in the sunset and Honolulu skyline. Enjoy food and drink specials, hourly prizes, power card giveaways and many more surprises. Score an extra point as ​all games are half-off, all day​! Dave & Busters dress code and house policies are in effect (check website for details). The ​Miss America Organization​ has been a Children's Miracle Network Hospital partner since 2007. Miss America contestants annually contribute tens of thousands of community service hours and have raised over $15 million for Children’s Miracle Network Hospitals and Miss America scholarships since 2007. As ​Miss Ala Moana, Sarah Champayn Look​, supports these organizations through her platform,​ The Kīnāʻole Project.​ The Kīnāʻole Project encourages personal ​involvement​ in service,​ ​use of​ innovation​ in problem solving, and being an ​influence​r for good. Miss Look will be competing in the Miss Hawaii Scholarship Program on June 2, 2018 at the Hawaiʻi Theatre. Miss Hawaii is the state-level qualifier for Miss America. Kapiʻolani Medical Center​ is Hawaiʻi’s only ​Children's Miracle Network​ Hospital providing comfort, treatment and hope to thousands of sick and injured keiki each year. For thirty years, gifts received through Kapiʻolani Children's Miracle Network have helped thousands of Hawaiʻi's children and their families receive the medical attention close to home. Whether they suffer from childhood afflictions, injuries or accidents or fight bigger challenges like premature birth, birth defects, cancer and asthma. Gifts have provided the quality care every family deserves by purchasing state-of-the-art medical equipment, assisting with neighbor-island travel and providing for education and research. Mahalo to our sponsors: Miss Ala Moana 2018, The Kīnāʻole Project, Dave & Busters, Panache Hair Sculptures, Hana Hou Couture, POV Studio Hawaiʻi, Look See Productions. Sponsorship opportunities are still available; please contact us for more information.